!! OMG, yuuuuuuge drug bust by German police finds 5,000 ecstasy pills shaped like Donald Trump !! Except when you eat them – they spread love – not hate! Oh, the irony! The item branded with the Trump name and face? A humongous drug stash seized by German authorities on Saturday. Five thousand ecstasy pills to be exact. 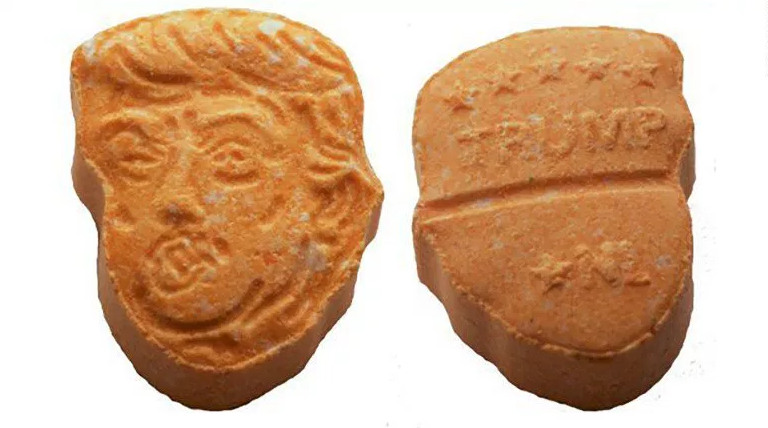 And the selling point of the illegal drug, listed in the high risk end of the U.N.’s classification of addictive substances, is an unusual one—every pill is shaped like Trump’s head, completel with large overcomb and pouty face stamped on the front, and his name emblazoned on the back in all caps. Ecstasy is widely sold illegally across Europe and often taken by young partygoers for the feelings of euphoria it can provide. Police in Osnabruck found thousands of the pills in the back of a van while completing a road check on Saturday night. The vehicle was a van registered in Austria driven by a 51-year-old man. He had his teenage son, a 17-year-old, with him and had traveled from the Netherlands, according to German magazine Der Spiegel. The total street value of the stash seized in Germany is estimated at €39,000 ($46,000). It would have cost €11,000 ($13,000) to purchase the tablets to sell on, so would’ve made a yuuuuuge profit. Hmmmm, maybe Trump should eat some of his own head and change his perspective! Be the first to comment on "OMG, yuuuuuuge drug bust by German police finds 5,000 ecstasy pills shaped like Donald Trump"